Bumble: The New Tinder ? There is no doubt that NOW is the time for dating apps to shine –Tinder, Coffee Meets Bagel, OKCupid, Plenty of Fish, and now Bumble. 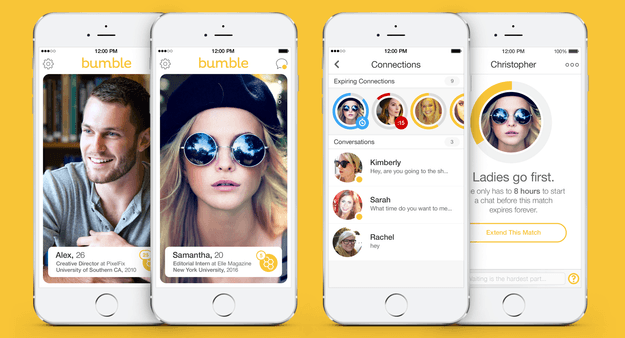 Bumble is developed by ex-co-founder of Tinder. As we all heard on the news and media, Whitney Wolfe received a $1 million dollar settlement after filing charges against a coworker. Her situation inspired her to develop her own dating app. Much like what we love about Tinder so much, Bumble also swipes left or right. The biggest difference is that only women can start chatting first. Wolfe created this feature to reduce the sexual harassment that often takes place in the use of Tinder. With all of Tinder’s new updates and limited swipes, maybe Bumble is the new way to go! Here are some of the major features that make Bumble different from the rest. -You can add your place of work and job along with your school to you profile. -Matches can be expired within 24 hours but each side can extend the match for another 24 hours to buy a little more time so don’t lose hope fellas! Though Wolfe’s intentions and implementations of precautions are great, it is not the only way for women to be in charge. Remember ladies, you can block and ignore anyone you want at any given time, you don’t need a dating app with some curated features to help you feel empowered because you should always be empowered regardless! Anyways, you are the judge! Would you/have you tried Bumble? Tell us about your Bumble experience, we’re buzzing to know!